Smart, visually-stunning, easy to use. Wix has become one of the world’s most popular website builders due to the right combination of user experience, beautiful templates, and a marketplace for apps that can make any website look—and perform—like it was designed by a team of professionals. 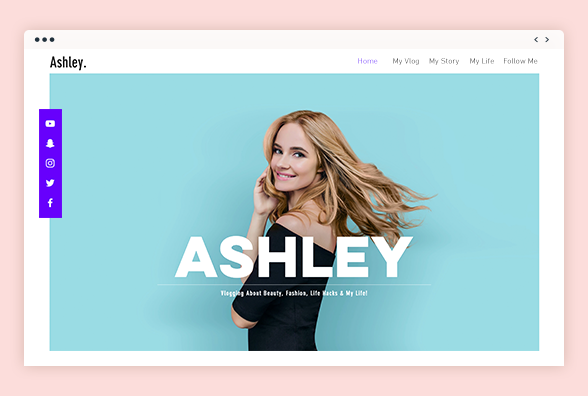 Wix has perfected drag-and-drop website design, giving users a canvas that they can easily and intuitively craft on their own, no matter their level of expertise. And while many website builders require you to acquire hosting on your own, Wix is a one-stop shop that will host your site and also give you the workshop to create a site perfectly suited to you. ​The simplicity of Wix makes it a great choice if you are looking to launch a website but are intimidated by the thought of designing a site of your own. You might think you need to know how to code or take an online course first, but Wix does a great job of leading you through the process no matter your level of expertise. 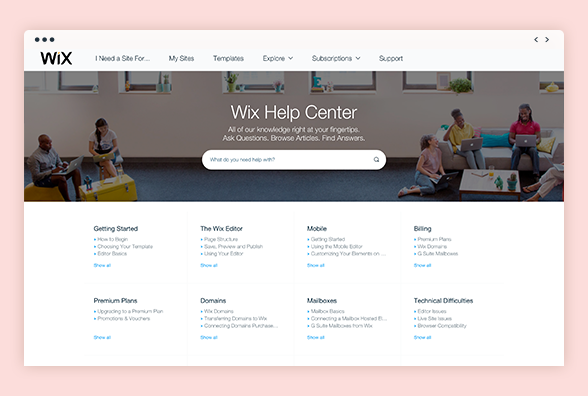 The Wix Help Center is an extensive and informative knowledge base where you can find answers to your web design questions. Wix has also invested a great deal in producing video tutorials to show how to use the sitebuilder effectively. Wix’s 500+ beautifully-rendered templates are ideal for small business owners who want to showcase their brand. With Wix, a brewpub owner or small-scale clothes designer can highlight their offerings on a site that will really make photos and logos pop, and which is easy enough to design that they don’t need to worry about losing valuable work time wrangling with a website. Imagine you’ve got an empty tray and you’re heading down the salad bar, grabbing a little bit of this, a little of that, arranging it on your tray just the way you like and it’s all up to you. It’s a similar experience with the Wix drag-and-drop interface, where the site is a canvas that you move around and paint as you see fit. It really only takes a few minutes to get the hang of using the system, which is one of the most intuitive anywhere. Simply pick a template that you like (with more than 500 options this might take you longer than you think) and start playing around with it. You don’t even need to sign up for a paid account before you can start testing out the system. Think of Wix as a visually-based system—you don’t need to understand or write code—you just need to manipulate the canvas you see before your eyes till it looks the way you want. Wix also includes extensive help features, including a knowledge base you can access from the editor, as well as hundreds of tutorial videos online. Another thing that simplifies Wix is the fact that all content is hosted on Wix servers, so you never have to worry about managing a web hosting account. A major part of the visitor experience when they come to your website is how it looks and that crucial first impression when the homepage loads. 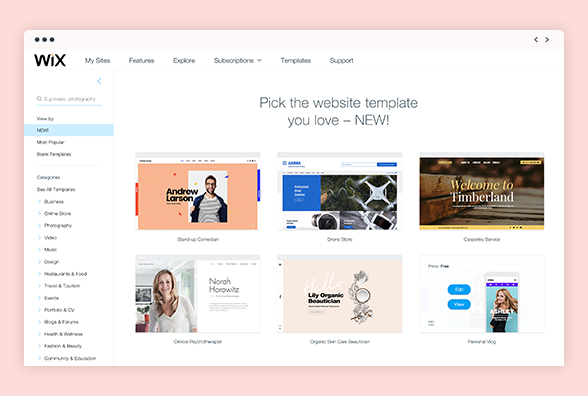 With Wix you can definitely put your best foot forward, with more than 500 beautiful, richly-designed templates split across over 70 different categories. With so many templates you can get pretty niche, from templates suited to political blogging or a cupcake trailer, allowing you to find something that perfectly matches the image you want for your site. Go to the templates section of the Wix website and you can scroll through the available templates one by one. You can scroll over any template and click “info” to see an explanation of it, including which type of sites it’s best suited to. You can press “view” to get a demo of how the site looks, or just press “edit” to start working on the template and putting the pieces together how you like. Wix also allows you to select a blank template, and design the entire template by yourself step by step, if you’d like. One drawback of Wix though, is that if you decide to change your site’s template, you’ll need to start all over from scratch, you can’t simply migrate the content to a new template. You also can’t edit the HTML or CSS codes. Wix also helps you create a great look for your site with a very large collection of professional photos that you can use on your site for free. So not only do you not need to know how to code, you don’t need to know how to take a decent photo either. Your website is important for you, and even with the best images and brilliant content, it won’t matter much if people don’t find your site. Search engine optimization (SEO) improves your site’s ranking in Google search results and can vastly increase traffic. With Wix you can build a personalized SEO plan, and use a keyword analyzer that will let you know which written content can help increase traffic on your site. Wix will help you improve your meta tags - your titles and descriptions - in a way that increases your search engine visibility. It also helps you improve your site URLs, and will give you tips about crafting alt text and using hyperlinks as needed. The personalized SEO plan will give you a step-by-step guide to how you can improve, and Wix will also help you peruse Google Analytics data on your site to understand how users get to you and how to increase their numbers. Wix also has the handy Site Booster app, which you can install to make your site more visible to users in your area. It is one of a large variety of apps on the Wix App Market that are focused on SEO. Parallax scrolling is a web design effect that creates an immersive experience for viewers. In parallax scrolling, the site background and foreground are separate, and as a reader scrolls down, the two sections move at different speeds creating a feeling of depth on your site. It's a truly unique way to incorporate large, captivating images with text and can increase the time that users are on your site and how long they stay on particular articles. This feature allows you to showcase your images and other content on a variety of slideshow galleries that can increase engagement and the time users are on the site. The Wix Pro Gallery is another way to really improve the appearance of your images, including the radius and threshold among many other aspects. You can also make every image shareable on social media. Wix sees the ADI feature as “our biggest innovation to date,” and it does sound like the type of thing that has the potential to be revolutionary. The feature uses an algorithm to build your website automatically, after asking a few questions to gauge you and your business’s or website’s needs. You can always edit and tweak the ADI designed site however you see fit. Give it a shot on your site, see how it can work for you, there’s nothing like it out there. The Wix App Market gives you options to take your site to the next level. There are literally hundreds of apps, made by Wix and third-party providers that can handle everything from SEO to Ecommerce solutions, scheduling solutions, and image and video tools. Many of these apps are free and there are also several premium apps. The app store is a great way to build your site to your very specific needs, step by step, in an a la carte fashion, making it the best site it can be. Spice up your website by adding a background video. It's free from Wix videos and you can easily upload your own video. The videos do not play music themselves, but you can also add your own music to play automatically when the page loads. It is worth noting that the video backgrounds won't display on the mobile-friendly version of your site. Among the hundreds of Wix templates,60 are designed specifically for online stores. When you sign up for Wix you have two separate plans for online stores. These are the Ecommerce plan at $16.50/month, and the VIP plan at $24.50/month. Both plans are very similar - both include unlimited bandwidth and 20GB storage—but the VIP plan provides you with a professional site review and 10 email campaigns a month, which you could utilize to increase your company's promotional activities and outreach with customers. Wix Ecommerce solutions also accommodate the use of coupons and discounts which you can use to attract new customers. Wix online stores help you easily track your sales and manage shipping, and also integrate PayPal to handle transactions, all of which are kept secure. One problem with Wix business solutions is that they do not include automatic Facebook integration. If you want to get your website up on the world’s largest social media network, and make sales directly through Facebook, you’ll need to install a third party app on the Wix market. The app is made by Shopial and costs $6.99/month. You can also download a free version, but it only lets you display up to 9 items. While other website editors use the same editor for blogs, Wix has a special blog posting interface that you can use if you’d prefer. Starting a Wix blog is as easy as you’d expect. You just sign into your account, pick a blog template and then open the Wix Blog Manager and create a new post. You can then create categories for your posts and organize accordingly, and also schedule them for later publication, or just post them immediately. You can choose a different design scheme for your blog, or just keep the one you have on the rest of your site. Wix also lets users comment on your blogs and includes special sharing options. The majority of potential visitors to your site have smart phones and use them on a daily basis. You need to make sure your site runs great on mobile devices, and with Wix you can set this up easily. When you create a website on Wix, a mobile version is automatically created. Even better, Wix has a mobile editor which allows you to change the design of your mobile website without altering the desktop version. In order to optimize your mobile version, just go to the website editor, and click on the mobile icon in the top left corner. This will take you to an editor where you can make all types of changes to the mobile version, without changing your overall site. You can check preview at any time to see how the site will look on a mobile device, and then publish when ready. A site that has been mobile-optimized will perform better in terms of SEO, increasing your traffic by bringing both of your sites under a single URL. Every paid Wix plan comes with hosting included, as well as the ability to connect your domain to the webpage. Once you start paying more, that’s where the differences happen. With the most basic “Connect Domain” plan you also get 1GB of bandwidth and 500MB storage for $4.50/month, but you’ll still have Wix ads on your site. By spending an extra $4/month for the Combo Plan you get 2GB bandwidth and 3GB storage. Every payment plan after the Combo Plan includes unlimited bandwidth, and the main differences are in terms of storage and the ability to run an online store, which is available in the Ecommerce and VIP plans. The Unlimited, Ecommerce, and VIP plans all include $75 in ad vouchers, a form builder app and the Site Booster app. The VIP plan costs $24.50/month and also allows you to run 10 email campaigns/month for targeted marketing, and a professional site review is included. Really it all depends on what you need for your site. If you’re just running a simple blog to upload your writing and photos, then the Connect Domain plan could provide you enough bandwidth and storage and allow you to use your own domain. If you’re looking to run an online store, you’ll have to go with either the Ecommerce or VIP, both of which are good bargains. Bottom line, it’s up to you, and Wix makes it easy to get yourself set up just right. You can start a Wix page today free of charge and be up and running in 5 minutes. With a free plan though, your site won't be linked to your own domain and your site will have “powered by Wix” ads featured prominently on the homepage. The free plan is a great way to try out Wix with no strings attached, but you won’t get the full experience of running a premium Wix site; Besides, having Wix ads and a Wix URL on your personal website isn’t the best look for a business trying to project an image of success online, so it’s worth it to check out the paid options. On Wix you don’t have your own dedicated server that you can run security for. Instead, your site is hosted on Wix’s servers, and the company is responsible for your security. Wix says that the company uses full-time security experts and advanced security tools to stay ahead of any security issues, and regularly audits themselves in order to test the security system and ensure its effectiveness. Wix also uses “multiple layer security architecture,” which it says is geared to protect against zero-day issues. Also, your passwords and other information are stored securely in a highly encrypted manner, and even in the event of a hack, Wix says your password will be safe. Your Wix site will be secured by HTTPS/TLS encryption, which is especially helpful to keep customers and their details safe while they’re shopping. Wix also lets you enable phishing and malware protection, which checks your online activity in order to gauge how much of a threat you face. Wix does not guarantee the security of your personal information, and encourages users to set strong passwords and to not use email and instant messaging for sensitive messages. The Wix App Market features a large number of apps made by third-party providers and Wix says these services may have access to some of Wix users’ personal information. Wix says the company is responsible for the personal data it receives and transfers to a third party and is responsible for ensuring that it is used in keeping with the Privacy Shield Principles. Third party developers agree to sign the Wix App Market Partner Program Agreement, which it says places restrictions on who they may access, what they can store and how they can use information provided to them, but also adds that Wix is not responsible for these companies’ actions and advises users to read all security clarifications before deciding whether to install a third party app, or to put any outside integration on their site. Wix has invested a great deal of man hours and know-how in developing one of the most extensive, easy-to-use knowledge bases of any website builder. This resource includes, articles and blogs, as well an FAQ section and videos that walk you through all aspects of running your Wix site. Chances are that anything you have a question about can be answered there, but if not, there are plenty of forums online where other Wix users share their issues and solutions. In addition, online you can easily find more than 300 Wix tutorial videos made by the company, which can walk you through all types of issues. If you’re still coming up empty, you can also check out the Wix support center. You can reach out to the company by filling out an online ticket with your questions, or you can contact the Wix call center during regular business hours PT. If you have invested in a premium account, you’ll enjoy premium support. This just means that any questions you have are given priority status, and you should receive an answer quicker than otherwise. Designing a website isn’t like designing a business card or an evite to a birthday party. It’s a more complicated, in-depth process that takes real effort if you want to do it right. That said, with Wix this process is easier than ever. Wix has an interface and overall user experience that has made it one of the world’s most popular website builders, combined with beautiful templates and a striking appearance. It’s an ideal builder for blogs and personal websites, and also a great option for anyone running a small business that they would like to get online, not only because of the online store options, but also because the look of Wix will reflect very positively on the company that runs the site. If you’re the type that loves web design and getting up to their elbows in code, then Wix probably isn’t for you. But if you’re looking to launch a website for your business, a platform for promoting and selling, or just a striking personal website, Wix can host and build a website that will make it look like you had a professional on retainer. Founded in Tel Aviv in 2006, Wix has changed how millions of users from around the world build free websites. The platform's powerful technology makes it easy for both beginners and advanced users to get themselves online.